Did you know that the common man is exposed to at-least 7 hours of screen time every day? This means that over 100 days of a year we spend our time in front of digital screen! These shocking statistics also come with some equally shocking and disturbing news: screen time means exposure to harmful UV blue light rays which cause stain on the eyes and can also adversely affect our sleep cycle as well! A high tech solution for a digital problem, PROSPEK – Dynamic Computer Glasses provide users eyes with the right kind of protective layer that makes sure to block over 50% of the harmful UV rays emitted from screens! The sleek rectangular frame of the glasses along with the clear multi-coated lenses make sure there is no color distortion and the user’s line of sight is never hindered which would otherwise cause more strain on the eyes. The first thing that often catches your eye is the stylish yet very classy rectangular black frame with its medium sized borders. The frame works well for both men and women due to its dimensions as well as design! To help enhance comfort, the manufacturers have also added springs on the temple areas which allow the frame to comfortably sit on a variety of different shaped faces. Furthermore, there are also reinforcements given on the far edges of the frames that are tucked behind the ears. These reinforcements along with the soft nose pads make sure that the frame is held in place by minimizing slipping. Moreover, the frame is made from polycarbonate material which is not only extremely durable but also lightweight! the polycarbonate material is known to withstand impact and will prevent the glasses from breaking or even shattering if they fall! The polycarbonate material has a sleek and dusty feel which enhances comfort levels when the glasses are worn for longer durations. Also, they are easy to maintain and can even be washed if required from time to time! In terms of the lenses used in the PROSPEK – Dynamic Computer Glasses, the user doesn’t have to worry about any color distortion as they are without any orange tint which is often found in computer eyewear. Despite having clear lenses, the glasses are built to block over 50% of the harmful blue rays that are known to have detrimental effects on the users’ overall health. Consequently, the lenses have over 9 coatings on them which not only enhances longevity but also the overall viewing experience. These coatings include, antiglare, antireflective, fingerprint resistant and anti-fog among others! The frame is made from durable polycarbonate material which is also lightweight and can withstand impact. There is a 90-day return policy with the glasses. Thee glasses don’t have magnification lenses. The polycarbonate material is an extremely lightweight and high-quality material known for its longevity. By allowing the remaining 50% of the light rays to pass through the lenses, users have a clear sight of vision. There is zero color distortion which means no yellow haze as found in other computer glasses. Additional coatings on the lenses enhance vision clarity and longevity of the lenses. The clear lenses of the glasses have zero color distortion, hence allowing users to keep wearing them throughout the day as well. The polycarbonate material is not very flexible and can not be readjusted if it loses its shape after some time. Stylish yet sturdy; the PROSPEK – Dynamic Computer Glasses are the perfect layer of protection you need from harmful blue UV rays emitted from screens! 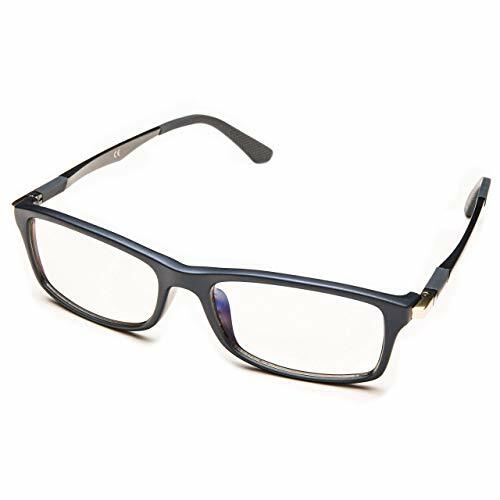 The glasses feature a sleek black polycarbonate frame which is very sturdy and will not shatter upon impact. Consequently, the rectangular frames are versatile and can be worn easily by both men and women of varying head sizes and face shapes! The lenses utilized in the glasses are known to block at-least 50% of the total UV blue light rays emitted from screens to help protect the user’s eyes from macular degeneration and additional eye strain and stress. The glasses help enhance sleep by protecting the circadian rhythm as well! When compared to similar products, the PROSPEK – Dynamic Computer Glasses managed to score better points on both design and performance levels. Consequently, the features incorporated in these glasses are top class which make them one of the best in the industry! In comparison to the Cyxus Blue Light Filter Computer Glasses, it was found that there were some considerable differences to the PROSPEK – Dynamic Computer Glasses. To begin with, the first highlighted differences between the two pairs in of the design. The Prospek glasses tend to have a more rectangular angle while the Cyxus Blue Light Glasses are broader and ore squarish in design. While both designs are very stylish in their own capacities, it solely depends on the user’s preferences and face shape when choosing the right ones for themselves. In general, rectangular frames seem to work best on most face shapes while squarish ones are best suited for angular faces. In terms of lenses, the ones by Prospek are definitely sturdier than the ones by Cyxus. This is because the Cyxus ones do not have all the additional coatings found on the Prospek ones which help enhance their lifespan as well as protect the users’ eyes from glare or reflection! Additionally, both pairs are well equipped to block the harmful rays but the Prospek ones do a better job and will block over 50% of these rays! In the end, it all comes down to the users’ personal preferences because both pairs of glasses will effectively block the harmful rays and ensure that the eyes of the users stay protected. Hence, depending on your face shape and head size, you should either go for the Prospek’s rectangular frame or the Cyxus’ squarish frame as both are black and made with a robust material which will not break easily upon impact! Living in a life without screens seems quite impossible in this technological age. However, with the right tools one can ensure that they stay protected from the harmful Blue rays emitted from gadgets that have screens! Whether you like to read before bed or are in an occupation that requires you to be in front of a screen for longer durations, in either case you are exposing yourself to health issues like digital eye strain and headaches. 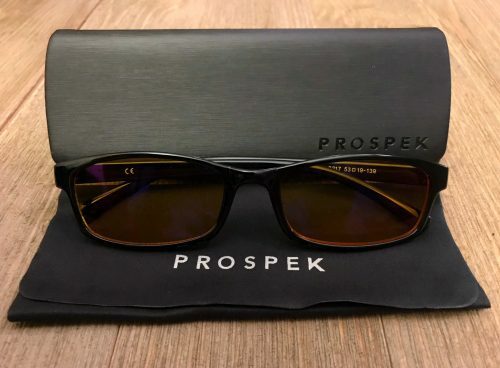 The PROSPEK – Premium Computer Glasses is the right tool to counter these rays and ensure better sleep and strain relief! 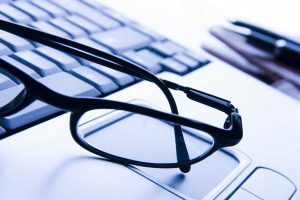 The glasses are lightweight and can be easily worn when using screens and kept away during regular work through the day. Consequently, their modern design and clear lenses also allow users to keep wearing the glasses throughout the day for longer durations as well. When it comes to your health, don’t take any additional risks!